The early workhouse directory, An Account of Several Workhouses..., first published in 1725, noted the existence of a parish workhouse at "Layghton" — presuamably Leighton Buzzard. A parliamentary survey published in 1777 recorded parish workhouses operating at Leighton Bussard (for up to 60 inmates), Eaton Bray (2), Edelsborough (30), Ivinghoe (50), and Wing (30). Very few Poor are to be found among the Quakers, the reason of which seems to be (as a Quaker observes) "that as soon as a member becomes idle, drunken or otherwise depraved, he is expelled from the society." The Poor are partly maintained in a Workhouse, and partly at home. 19 persons at present in the house ; some of them old or children unable to work. The boys are sent out to work for the farmers, a little lace is made by the women in the house. The whole earnings about 50s. a month. 44 out-pensioners receive at present £4 a week. Poor Rate : 1782-3, 3s. 6d. ; 1784, 4s. 6d. ; 1785, 3s. 6d. ; 1786, 4s. 6d. ; 1787-8, 3s. ; 1789, 4s. 6d. ; 1790, 3s. 6d. ; 1791, 5s. ; 1792-3, 4s. ; 1794, 5s. ; 1795, 4s. There is an Alms-house for eight poor women who have each an apartment, clothes, fuel, and 2s. 6d. a week. Donations amounting to about £22, are yearly distributed in bread to poor parishioners. The Workhouse is in an excellent situation, but, at present, does not appear to be very cleanly. Diet in Workhouse: Sunday, Tuesday, Thursday—breakfast—bread, cheese and beer or milk pottage ; dinner—beef, bread, pudding, sauce and broth ; Monday, Wednesday, Friday—breakfast—bread and broth ; dinner—cold meat ; Saturday breakfast—bread, cheese and beer ; dinner—suet dumplings or milk or water pottage. Supper every day—bread, cheese and beer. The Assistant Poor Law Commissioner assigned to Bedfordshire, Daniel Adey, had originally wanted to create a large union of 101 parishes centred on Bedford, and making use of Bedford's existing large and efficient workhouse. However, there was strong resistance from local estate owners who much preferred smaller unions where they exert more influnece. As a result, four smaller unions were created at Bedford, Ampthill, Biggleswade, and Leighton Buzzard. Bedfordshire: Billington, Eggington, Heath and Reach, Leighton Buzzard (3), Stanbridge. Later Additions: Chalgrave (from 1899), Eaton Bray (from 1845), Hockliffe (from 1899), Tilsworth (from 1899). Buckinghamshire: Cheddington, Eddlesborough (2), Grove, Ivinghoe (2), Linslade, Mentmore, Soulbury, Slapton, Stoke Hammond, Wing (2). Later Additions: Pitstone (from 1923). The population falling within the union at the 1831 census had been 11,824 with parishes ranging in size from Grove (population 21) to Leighton Buzzard itself (3,330). The average annual poor-rate expenditure for the period 1831-34 had been £11,257 or 19s. per head. The new workhouse was built to the south of Leighton Buzzard in 1836, on what is now the Grovebury Road Industrial Estate. The Poor Law Commissioners authorized an expenditure of £5,831 on the building which was intended to accommodate 350 inmates. The architect was William P Roote, who was surveyor to the Woburn Estate, and also responsible for the workhouses at Newmarket and NewportPagnell Buzzard, the latter of which Leighton Buzzard closely resembled. The Leighton Buzzard design was based on a courtyard plan which was popular in Kent, but rare elsewhere in the country. The site layout can be seen on the 1879 map below. The workhouse entrance was an archway at the north-east of the site. 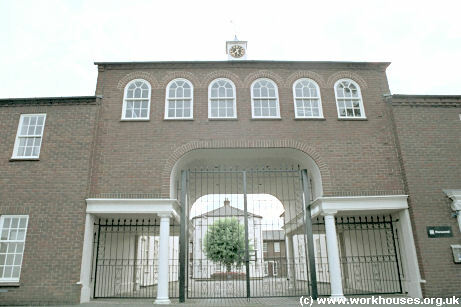 The entrance leads to a courtyard which is surrounded by the two-storey accommodation ranges. A three-storey administrative hub lies at the south-west of the courtyard. To the south-west, an enclosed semi-circular area was divided into smaller yards. The union was enlarged in 1899 when the adjacent union of Woburn was dissolved. The buildings were later put into temporary use as a prisoner-of-war camp. 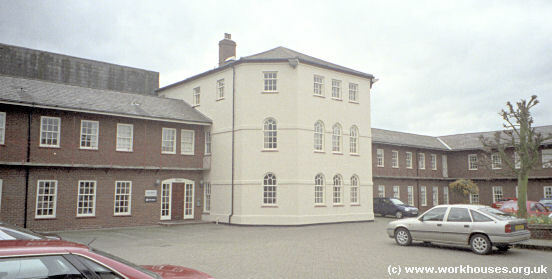 The workhouse buildings around the main courtyard survive and are currently (2001) occupied by the Lancer Boss company. Bedfordshire and Luton Archives and Records Service, Borough Hall, Cauldwell Street, Bedford. MK42 9AP. Many records survive including: Guardians' minute books and ledgers (1835-1930); admissions and discharges (1891-98; casuals 1914-21, 1926-30); births (1858-1936); deaths (1858-1940); indoor relief lists (1852-1929, with gaps); etc.